Definition at line 3153 of file winuser.h. Definition at line 3157 of file winuser.h. Referenced by _tWinMain(), create_async_message_window(), D3DTests(), DdeConnect(), DDTests(), GetClassInfoA(), init(), InitScreenSaveClass(), MyRegisterClass(), MyRegisterClass_wave(), RegisterAndCreateWindow(), RegisterApplicationClasses(), RegisterBlankClass(), RegisterCardWindow(), RegisterMainWindowClass(), RegisterMMCWndClasses(), RegisterTestDialog(), SetUpMDIChildWindowClass(), START_TEST(), test_button_class(), test_events(), test_icons(), TreeListRegister(), WDML_CreateServerConv(), WINHELP_RegisterWinClasses(), and WinMain(). Definition at line 3154 of file winuser.h. Referenced by _tWinMain(), CDummyShellBrowser::CDummyShellBrowser(), create_async_message_window(), D3DTests(), DdeConnect(), DDTests(), init(), InitEditWindowImpl(), InitFloatWndClass(), InitImageEditWindowImpl(), InitMainWindowImpl(), InitScreenSaveClass(), InitURLControl(), MyRegisterClass(), MyRegisterClass_wave(), register_subclass(), register_testwindow_class(), RegisterAndCreateWindow(), RegisterApplicationClasses(), RegisterBlankClass(), RegisterCardWindow(), RegisterMainWindowClass(), RegisterMMCWndClasses(), RegisterPreviewControl(), RegisterTestDialog(), scrollbar_test_init(), SetUpMDIChildWindowClass(), START_TEST(), TbdInitImpl(), test_builtinproc(), test_CoWaitForMultipleHandles(), test_create(), test_DeleteDC(), test_events(), test_GetClassInfo(), test_icons(), test_instances(), test_LVM_GETCOUNTPERPAGE(), TreeListRegister(), User32CreateWindowEx(), WDML_CreateServerConv(), WindowClass::WindowClass(), WINHELP_RegisterWinClasses(), WinMain(), and wmain(). Definition at line 3158 of file winuser.h. Referenced by _tWinMain(), create_async_message_window(), D3DTests(), DdeConnect(), DDTests(), GetClassInfoA(), init(), InitScreenSaveClass(), MyRegisterClass(), MyRegisterClass_wave(), RegisterAndCreateWindow(), RegisterApplicationClasses(), RegisterBlankClass(), RegisterCardWindow(), RegisterMainWindowClass(), RegisterMMCWndClasses(), RegisterTestDialog(), SetUpMDIChildWindowClass(), START_TEST(), TbdInitImpl(), test_button_class(), test_events(), test_extra_values(), test_icons(), TreeListRegister(), WDML_CreateServerConv(), WINHELP_RegisterWinClasses(), and WinMain(). Definition at line 3162 of file winuser.h. Referenced by _tWinMain(), BtnWindowClass::BtnWindowClass(), create_async_message_window(), D3DTests(), DdeConnect(), DDTests(), GetClassInfoA(), init(), InitEditWindowImpl(), InitFloatWndClass(), InitImageEditWindowImpl(), InitMainWindowImpl(), InitScreenSaveClass(), MyRegisterClass(), MyRegisterClass_wave(), register_testwindow_class(), RegisterAndCreateWindow(), RegisterApplicationClasses(), RegisterBlankClass(), RegisterCardWindow(), RegisterMainWindowClass(), RegisterMMCWndClasses(), RegisterPreviewControl(), RegisterTestDialog(), scrollbar_test_init(), SetUpMDIChildWindowClass(), START_TEST(), TbdInitImpl(), test_builtinproc(), test_CoWaitForMultipleHandles(), test_events(), test_icons(), TreeListRegister(), WDML_CreateServerConv(), WindowClass::WindowClass(), WINHELP_RegisterWinClasses(), WinMain(), and wmain(). Definition at line 3161 of file winuser.h. 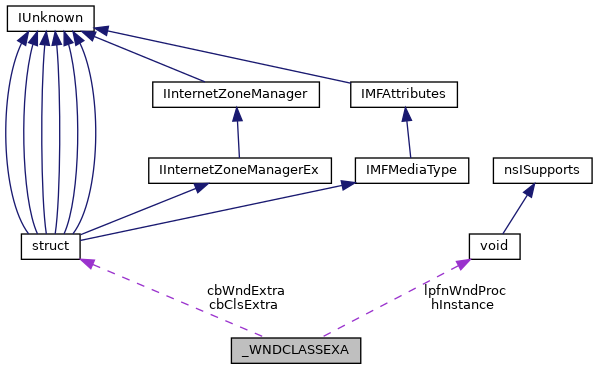 Referenced by _tWinMain(), AtlModuleRegisterWndClassInfoA(), create_async_message_window(), D3DTests(), DdeConnect(), DDTests(), GetClassInfoA(), init(), InitEditWindowImpl(), InitFloatWndClass(), InitImageEditWindowImpl(), InitMainWindowImpl(), InitScreenSaveClass(), InitURLControl(), MyRegisterClass(), MyRegisterClass_wave(), register_testwindow_class(), RegisterAndCreateWindow(), RegisterApplicationClasses(), RegisterBlankClass(), RegisterCardWindow(), RegisterMainWindowClass(), RegisterMMCWndClasses(), RegisterPreviewControl(), RegisterTestDialog(), scrollbar_test_init(), SetUpMDIChildWindowClass(), START_TEST(), TbdInitImpl(), test_CoWaitForMultipleHandles(), test_events(), test_icons(), TreeListRegister(), WDML_CreateServerConv(), WindowClass::WindowClass(), WINHELP_RegisterWinClasses(), and WinMain(). Definition at line 3160 of file winuser.h. 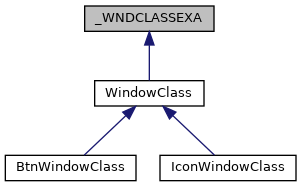 Referenced by _tWinMain(), create_async_message_window(), D3DTests(), DdeConnect(), DDTests(), GetClassInfoA(), IconWindowClass::IconWindowClass(), init(), InitEditWindowImpl(), InitFloatWndClass(), InitImageEditWindowImpl(), InitMainWindowImpl(), InitScreenSaveClass(), MyRegisterClass(), MyRegisterClass_wave(), RegisterAndCreateWindow(), RegisterApplicationClasses(), RegisterBlankClass(), RegisterCardWindow(), RegisterMainWindowClass(), RegisterMMCWndClasses(), RegisterTestDialog(), SetUpMDIChildWindowClass(), START_TEST(), test_events(), test_icons(), TreeListRegister(), WDML_CreateServerConv(), WINHELP_RegisterWinClasses(), WinMain(), and wmain(). Definition at line 3165 of file winuser.h. Referenced by _tWinMain(), create_async_message_window(), D3DTests(), DdeConnect(), DDTests(), IconWindowClass::IconWindowClass(), init(), InitEditWindowImpl(), InitFloatWndClass(), InitImageEditWindowImpl(), InitMainWindowImpl(), InitScreenSaveClass(), MyRegisterClass(), MyRegisterClass_wave(), RegisterAndCreateWindow(), RegisterApplicationClasses(), RegisterBlankClass(), RegisterCardWindow(), RegisterMainWindowClass(), RegisterMMCWndClasses(), RegisterTestDialog(), SetUpMDIChildWindowClass(), START_TEST(), test_events(), test_icons(), TreeListRegister(), WDML_CreateServerConv(), WINHELP_RegisterWinClasses(), WinMain(), and wmain(). Definition at line 3159 of file winuser.h. Referenced by _RegisterClassA(), _tWinMain(), AtlModuleRegisterWndClassInfoA(), CDummyShellBrowser::CDummyShellBrowser(), create_async_message_window(), D3DTests(), DdeConnect(), DDTests(), GetClassInfoA(), init(), InitEditWindowImpl(), InitFloatWndClass(), InitImageEditWindowImpl(), InitMainWindowImpl(), InitScreenSaveClass(), InitURLControl(), MyRegisterClass(), MyRegisterClass_wave(), register_subclass(), register_testwindow_class(), RegisterAndCreateWindow(), RegisterApplicationClasses(), RegisterBlankClass(), RegisterCardWindow(), RegisterMainWindowClass(), RegisterMMCWndClasses(), RegisterPreviewControl(), RegisterTestDialog(), scrollbar_test_init(), SetUpMDIChildWindowClass(), START_TEST(), TbdInitImpl(), test_builtinproc(), test_CoWaitForMultipleHandles(), test_DeleteDC(), test_events(), test_icons(), TreeListRegister(), WDML_CreateServerConv(), WindowClass::WindowClass(), WINHELP_RegisterWinClasses(), WinMain(), and wmain(). Definition at line 3156 of file winuser.h. Referenced by _GetWndprocA(), _tWinMain(), AtlModuleRegisterWndClassInfoA(), CDummyShellBrowser::CDummyShellBrowser(), create_async_message_window(), D3DTests(), DdeConnect(), DDTests(), GetClassInfoA(), init(), InitEditWindowImpl(), InitFloatWndClass(), InitImageEditWindowImpl(), InitMainWindowImpl(), InitScreenSaveClass(), MyRegisterClass(), MyRegisterClass_wave(), register_subclass(), register_testwindow_class(), RegisterAndCreateWindow(), RegisterApplicationClasses(), RegisterBlankClass(), RegisterCardWindow(), RegisterMainWindowClass(), RegisterMMCWndClasses(), RegisterPreviewControl(), RegisterTestDialog(), scrollbar_test_init(), SetUpMDIChildWindowClass(), START_TEST(), TbdInitImpl(), test_builtinproc(), test_button_class(), test_CoWaitForMultipleHandles(), test_create(), test_DeleteDC(), test_events(), test_GetClassInfo(), test_icons(), test_instances(), test_LVM_GETCOUNTPERPAGE(), TreeListRegister(), WDML_CreateServerConv(), WindowClass::WindowClass(), WINHELP_RegisterWinClasses(), WinMain(), and wmain(). Definition at line 3164 of file winuser.h. Referenced by _RegisterClassA(), _tWinMain(), AtlModuleRegisterWndClassInfoA(), CDummyShellBrowser::CDummyShellBrowser(), create_async_message_window(), D3DTests(), DdeConnect(), DDTests(), GetClassInfoA(), GetClassInfoExA(), init(), InitEditWindowImpl(), InitFloatWndClass(), InitImageEditWindowImpl(), InitMainWindowImpl(), InitScreenSaveClass(), InitURLControl(), MyRegisterClass(), MyRegisterClass_wave(), register_subclass(), register_testwindow_class(), RegisterAndCreateWindow(), RegisterApplicationClasses(), RegisterBlankClass(), RegisterCardWindow(), RegisterMainWindowClass(), RegisterMMCWndClasses(), RegisterPreviewControl(), RegisterTestDialog(), scrollbar_test_init(), SetUpMDIChildWindowClass(), START_TEST(), TbdInitImpl(), test_builtinproc(), test_CoWaitForMultipleHandles(), test_create(), test_DeleteDC(), test_events(), test_icons(), test_instances(), test_LVM_GETCOUNTPERPAGE(), TreeListRegister(), WDML_CreateServerConv(), WindowClass::WindowClass(), WINHELP_RegisterWinClasses(), WinMain(), and wmain(). Definition at line 3163 of file winuser.h. Referenced by _tWinMain(), create_async_message_window(), D3DTests(), DdeConnect(), DDTests(), GetClassInfoA(), init(), InitEditWindowImpl(), InitMainWindowImpl(), InitScreenSaveClass(), MyRegisterClass(), MyRegisterClass_wave(), RegisterAndCreateWindow(), RegisterApplicationClasses(), RegisterBlankClass(), RegisterCardWindow(), RegisterMainWindowClass(), RegisterMMCWndClasses(), RegisterTestDialog(), SetUpMDIChildWindowClass(), START_TEST(), test_events(), test_icons(), TreeListRegister(), User32CreateWindowEx(), WDML_CreateServerConv(), WINHELP_RegisterWinClasses(), and WinMain(). Definition at line 3155 of file winuser.h. Referenced by _tWinMain(), CDummyShellBrowser::CDummyShellBrowser(), create_async_message_window(), D3DTests(), DdeConnect(), DDTests(), GetClassInfoA(), init(), InitFloatWndClass(), InitImageEditWindowImpl(), InitScreenSaveClass(), MyRegisterClass(), MyRegisterClass_wave(), register_testwindow_class(), RegisterAndCreateWindow(), RegisterApplicationClasses(), RegisterBlankClass(), RegisterCardWindow(), RegisterMainWindowClass(), RegisterMMCWndClasses(), scrollbar_test_init(), SetUpMDIChildWindowClass(), START_TEST(), TbdInitImpl(), test_CoWaitForMultipleHandles(), test_DeleteDC(), test_events(), test_icons(), TreeListRegister(), WDML_CreateServerConv(), WindowClass::WindowClass(), WINHELP_RegisterWinClasses(), WinMain(), and wmain().